Violet Hadia Chafardon, 90 years, of McConnellsburg, PA, was lifted into the arms of her Lord and Savior Jesus Christ on Sunday November 25, 2018 at the Chambersburg Hospital with her family by her side. She was born on Wednesday January 25, 1928 in Slippery Rock, PA, the daughter of the late Ray Luther and the late Romaine Stewart Luther. 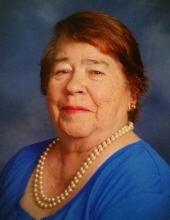 Violet was a member of St. Stephens Catholic Church, McConnellsburg, and a true Christian woman. She was a hard worker who kept herself busy with her family, her love of animals and the joy of gardening. Violet and her family vacationed in McConnellsburg since 1970and permanently moved to the area they so loved in 1980. She was employed as a cook at the Catholic School in McConnellsburg. Later she was hired as the Manager of the Fulton County Food Basket where she loved helping those in need for 16 years. Violet is survived by her 5 children: Francis J. Chafardon Jr. of Peach Tree, GA, Michael A. (husband of Lea) Chafardon of Townsend, DE, Susan M. Cubbage of McConnellsburg, PA, Richard D. Chafardon of McConnellsburg, PA and Joseph A. (husband of Debra) Chafardon of McConnellsburg, PA, 15 grandchildren (Stephen, Christine, Dennis, Bernadette, Michael Jr., Jade, Jennifer, Emilee, Tara, Amber, Michelle, Joseph II, Anastasia, Vincent and Erin) and 15 great grandchildren. She is also survived by one brother Martin Luther of Fort Pierce, FL and one sister Rae Dolce of South Carolina. An evening of visitation will be held on Sunday, December 2, 2018 at Kelso-Cornelius Funeral Home in McConnellsburg, PA from 5:00 PM until 8:00 PM. A Mass will be held on Monday, December 3, 2018 at 8:00 AM at St. Stephen Catholic Church, 303 Lincoln Way West, McConnellsburg, PA with interment at Indiantown Gap National Cemetery. Online condolences may be expressed at www.kelso-corneliusfuneralhome.com. To send flowers or a remembrance gift to the family of Violet H. Chafardon, please visit our Tribute Store. "Email Address" would like to share the life celebration of Violet H. Chafardon. Click on the "link" to go to share a favorite memory or leave a condolence message for the family.